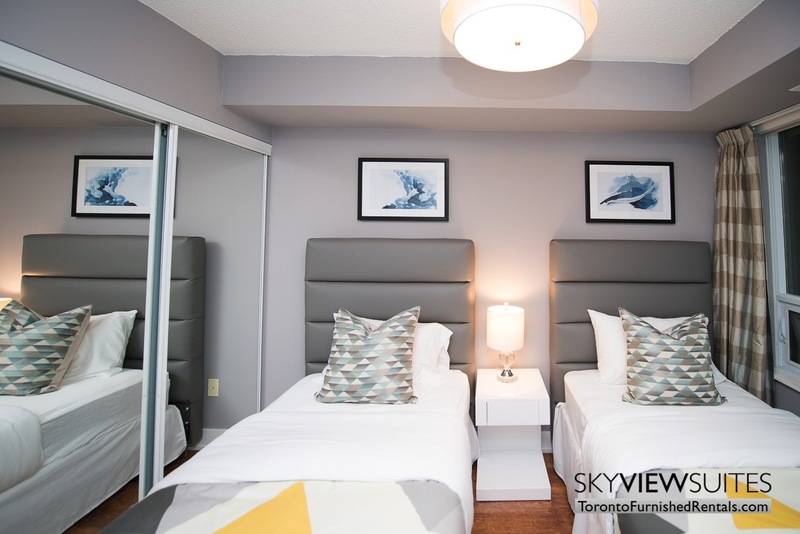 Guests who are looking for a modern, spacious and comfortable furnished apartment in the heart of downtown Toronto will love this suite. 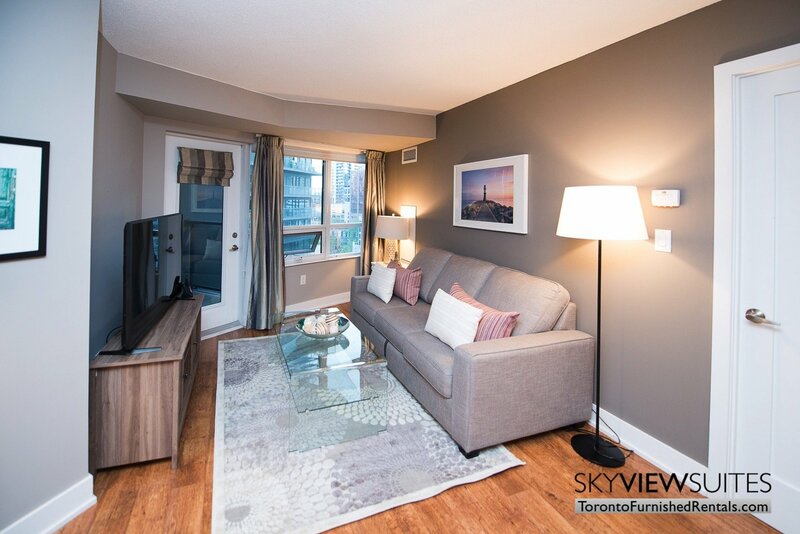 This 950 square foot short term rental has 3 fully furnished, private bedrooms and two bathrooms, making it an ideal space to share with family, friends or colleagues. 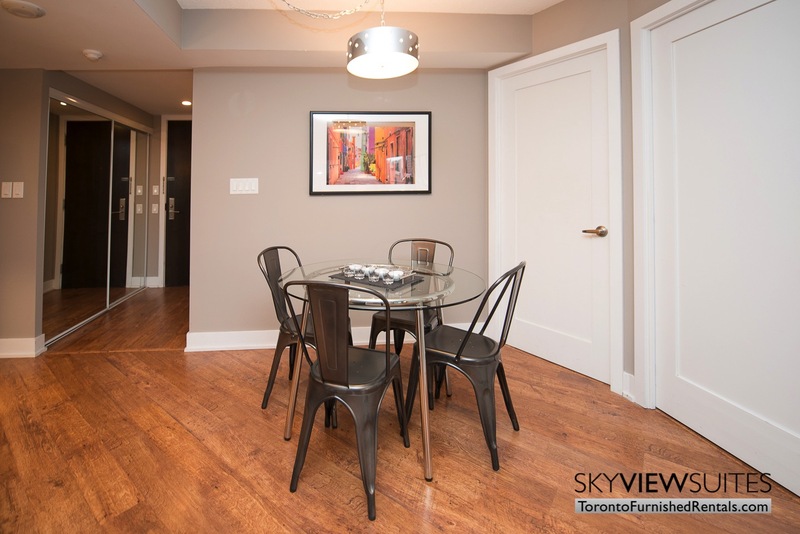 From the moment you walk in this Toronto furnished living suite, you understand that it is a modern and comfortable space. 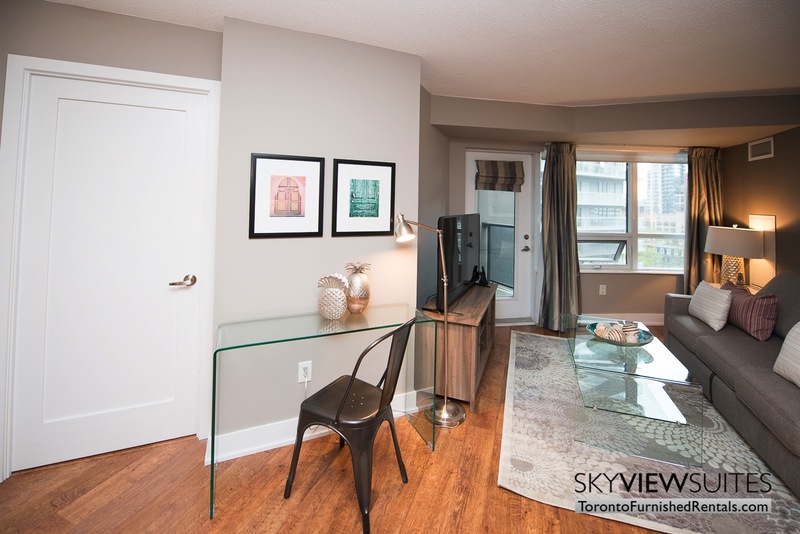 Beautiful hardwood flooring flows throughout the unit and large windows frame the space. 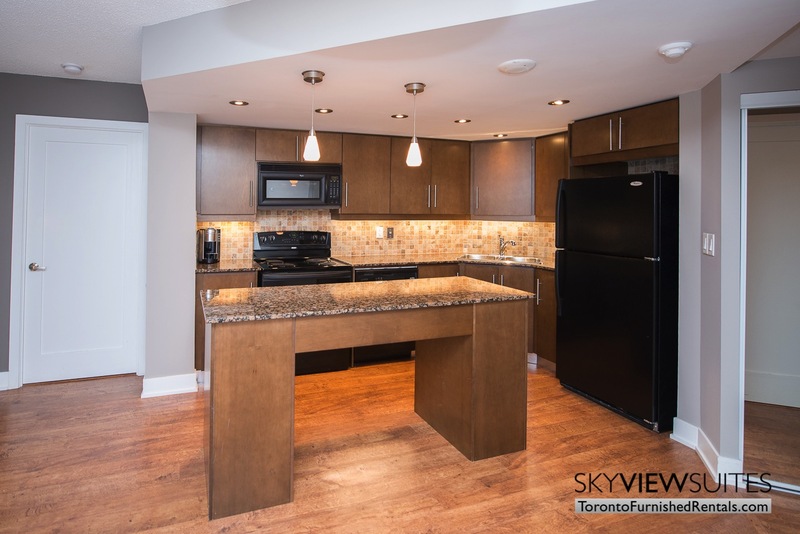 The kitchen of this suite features modern dark wood cabinetry and durable and sleek grey granite countertops. We invite all guests to cook just as they would at home in this space. We provide our guests with all necessary cooking utensils and appliances as well as cutlery and dishes to serve your meals on. This kitchen also features a large island that allows for extra counter space and is the perfect feature for serving food and entertaining. 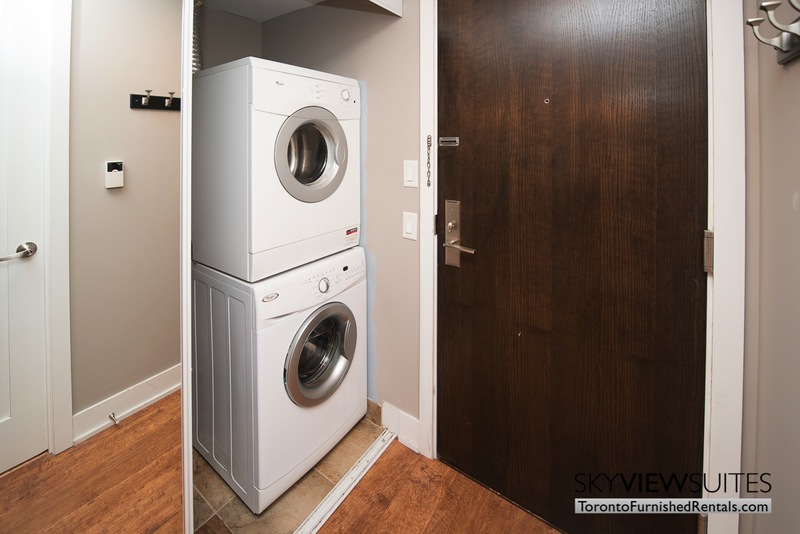 All of the appliances in this unit are clean, and up to date and accessible for guests to use as they please. Guests will be pleased to find a small dining table, only steps away from the kitchen. In the main living space, guests will also find the pull out couch that is positioned in front of your very own entertainment centre. This feature allows creates yet another sleeping space for guests. 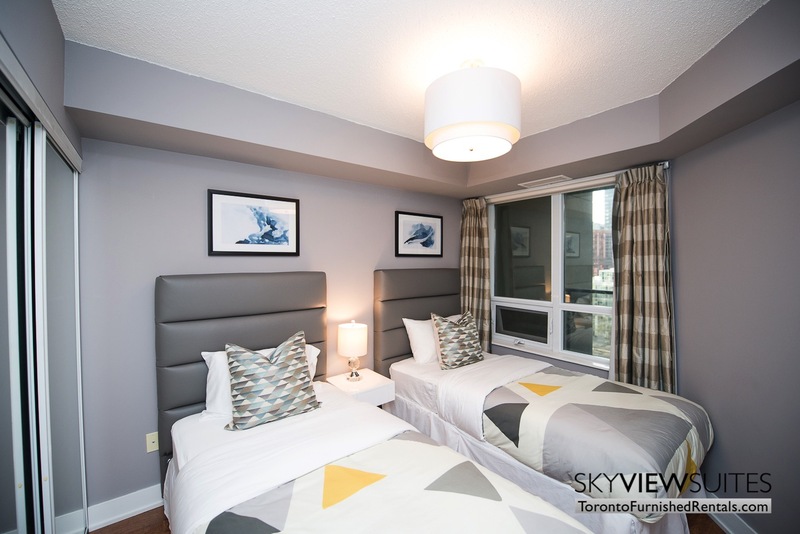 If looking for fully furnished apartments for rent in Toronto will also be pleased to know a flat screen TV complete with DVD player and Roger VIP Digital Cable package also comes with this unit. Use of this system and all its features are included in the rent price. Enjoy a family movie night or settle into the comfortable couch and catch up on your favourite shows to end the day. Another aspect of this suite is that there is a small balcony just off the main living room, which is ideal for getting some fresh air. As mentioned above, there are three furnished bedrooms in this extended stay apartment rental, all of which offer slightly different layouts. The first bedroom offers a full sized bed and a large closet with sliding glass doors. The second bedroom features two single beds, which is a great layout for those traveling with children. 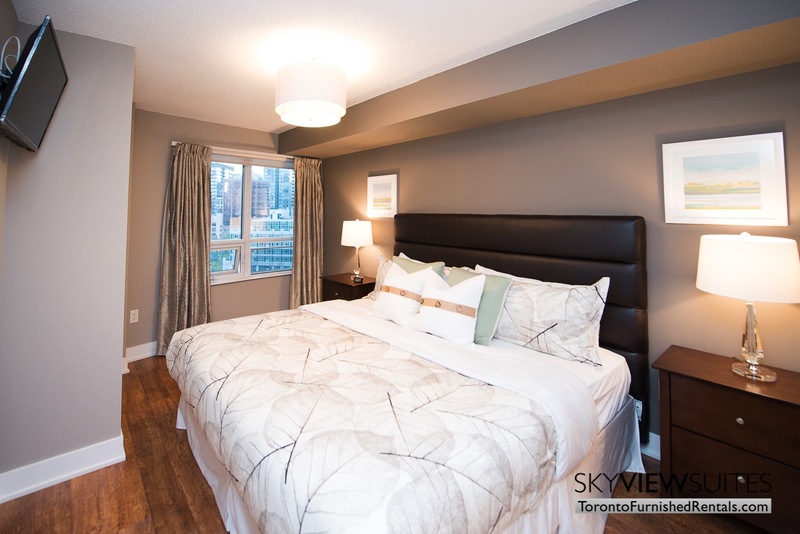 This second bedroom also has a large sliding door closet to accommodate all of your belongings during your stay. 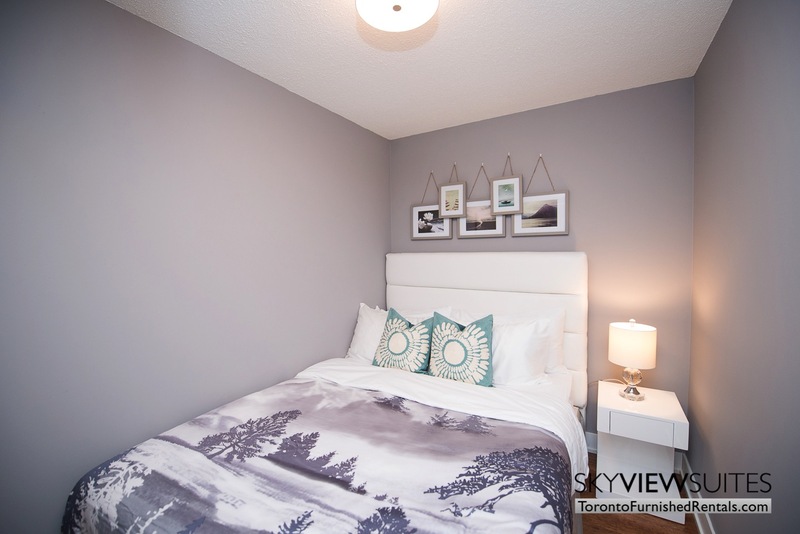 Last but not least is the master bedroom, which is an impressive space complete with a king sized bed, large walk in closet, wall mounted TV and ensuite bathroom. All of the linens for the bedrooms and bathroom are complimentary. Like the bedrooms, the bathrooms are slightly different in their layouts. 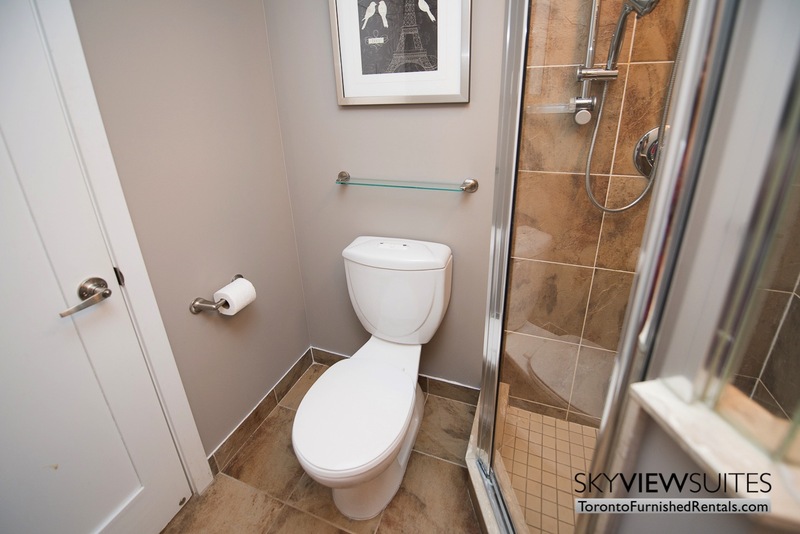 The first, located just off the main room has an upright shower, enclosed with a glass stall. The second features a shower/bathroom combination. If you like this unit and are travelling with children, you may want to check out our kid friendly Element B unit. 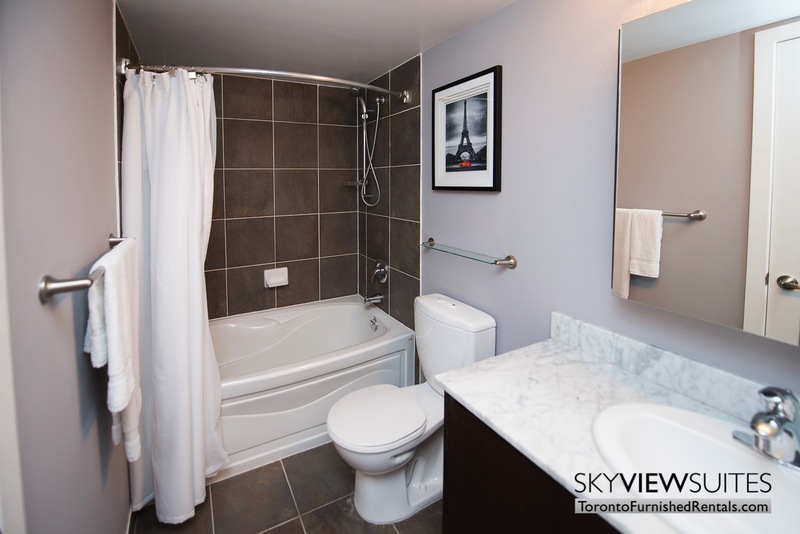 The location of this three-bedroom furnished rental is conveniently located in the core of downtown Toronto. The closest most popular intersection is Blue Jays Way and Front Street. This is one of the most prominent intersections in all of Toronto. 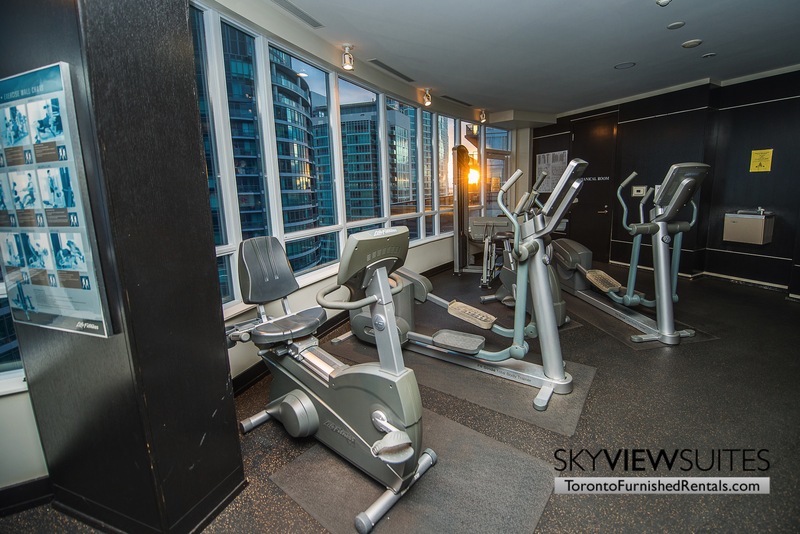 This suite is placed within Toronto’s infamous entertainment district. This district is home to the Toronto’s most iconic and identifiable landmarks. 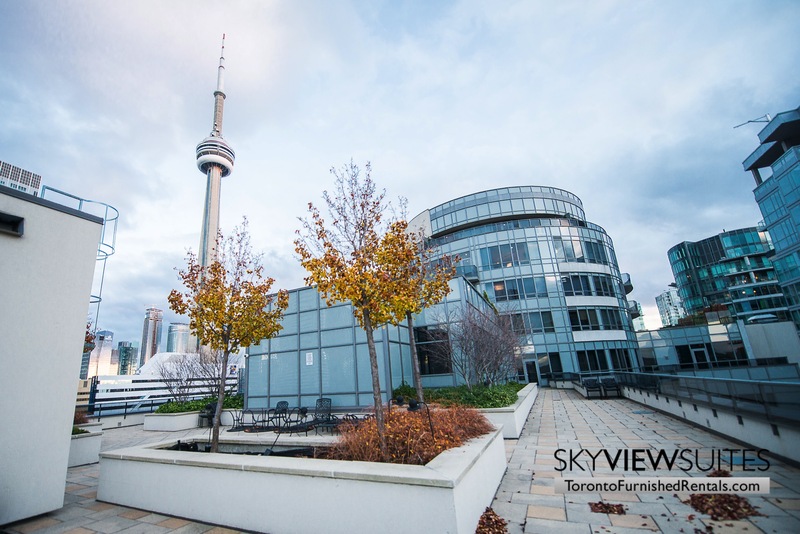 Just a few minutes away is the CN Tower, which is the second tallest free-standing building in the world and upholds a fabulous glass floor, revolving restaurant, and daredevil Edge walk. Corporate clients will be pleased with this neighbourhood as well. It is a very close walk to the financial district as well as public transportation to take you to every corner of the city. However, after the workday is done, there is an endless array of restaurants and bars to check out. Guests who enjoy beer will want to check out Bar Hop. This restaurant and brew house offers 36 different rotating taps, a wide selection of bottled brews and tasty shareable dishes. The host building is just as impressive as the furnished unit is houses. Guests of the Element F short term rental will have access to amenities including; a full sized gym, sauna, and a hot tub. 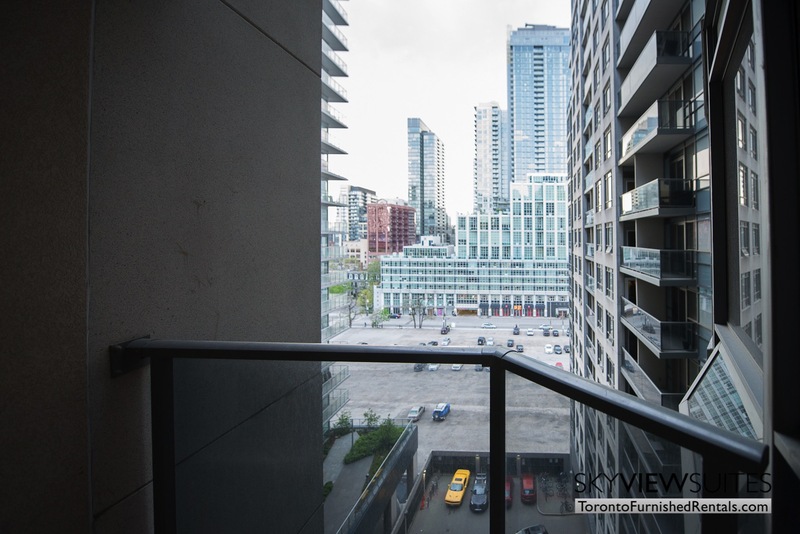 At the very top of the building is a rooftop terrace that overlooks the city and CN tower. Guest can enjoy the BBQ facilities in this area especially during the warm weather. The building also has a 24 hour security desk for peace of mind during your extended stay.